Make Your Goals A Reality Today! Our team is dedicated to your success and we prove that every day with a team of coaches who go above and beyond to make your goals a reality. Our staff includes highly trained health professionals who will guide you in every step of the way toward sustainable results. We value a holistic approach to fitness and wellbeing, offering you tools for success in all the areas that impact your life. Our training respects health as an integrated system rather than separate parts including the mind, body and spirit. At Vigeo Health, we stand by the idea that you don't need to be a pro to train like one. That's why we're offering high-level instruction and coaching to people from all walks of life with varied levels of fitness. We'll meet you where you are and help you get better every day. With us, you can count on a safe and supportive environment every time you train. Gone are the days when you feared egos and intimidation. We're committed to making everyone feel welcome and we're proving that one day at a time. Customize every aspect of your fitness training and walk away with the results to prove it. 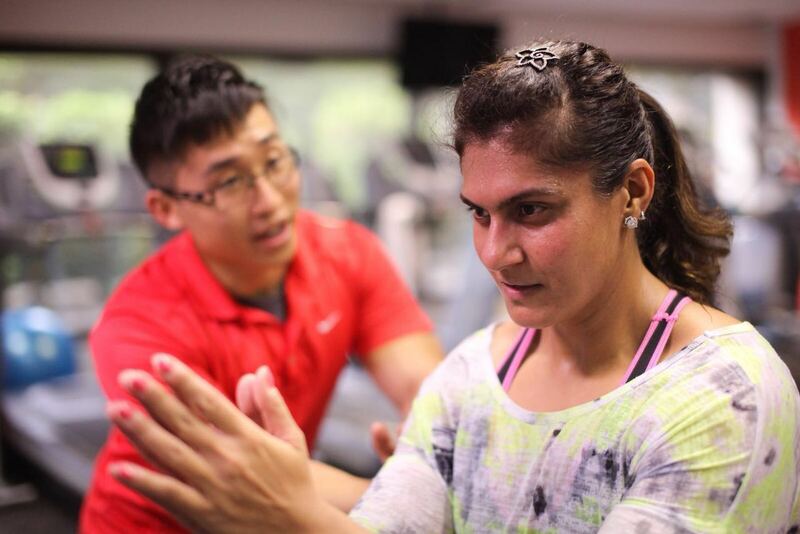 Our Personal Training in Singapore is designed to help you find sustainable success no matter what shape you're in. Take on a fitness journey like never before with our Semi Private Training in Singapore. We're helping men and women of all skill levels find success, all you have to do is commit to the process. Learn more or get started today! Take on a high-energy workout and enjoy the great outdoors during our Bootcamp training in Singapore. We're here to keep you motivated and supported like never before. Join us in Fort Canning Park today! We're Committed To Impacting Every Aspect Of Your Life! At Vigeo Health, we're committed to a total-body approach. Many of our workouts rely on functional movements and heart-racing exercises and everything we do is designed to keep you on your toes. In no time, you can enjoy the physical benefits that come with hard work and sustain them for years to come. Look, it's not all about weight. That's not why we train. But better health can often result in weight loss and we're here to introduce you to a wide range of solutions for the bad habits you've developed. Nobody is perfect, but with us, you can learn how to fuel your body, nourish it, and train it. All three together produce some incredible results for your health. Feeling stiff and immobile? Or worse, embodying pain and discomfort, and you have no idea why? We can help you feel better. With our thorough assessment of how you stand, move and breathe, you will understand the areas of the body that is holding you back. Break free from the cycle and feel regain your youthful self again. You've known this your whole life: self-confidence is infectious. It bleeds over into everything you do. It hovers over you like a shield. And we're here to help you find it. Our training is built on the idea that small accomplishments create big ones. We're helping you find success one step at a time. Get coached by passionate professionals who are 100% dedicated to your success and well-being. Our coaches are selected based on their love to help people and they undertake ongoing upgrading to evolve their services towards your experience and goals. In Vigeo, you are treated like family the moment you step into the facility. You will make many friends who love and appreciate you. We listen to your every need, guide you in every step and celebrate your every victory that we achieved together. Welcome to Vigeo Health & Fitness, Singapore's home for sustainable fitness training and a path to better wellness. We see fitness as a driver towards health. We believe that fitness goes beyond losing weight or gaining muscle mass, it is about eating well, moving pain-free, sleeping & recovering better, active management of health, promoting bodily and mental resiliency through physical activity and lifestyle choices. Fitness is, ultimately, a driver to make your life better outside of the gym. That's why our training offers a holistic approach to success and surrounds you from day one with professional coaches and dedicated support. Join us in Singapore today. Just fill out the short form on your screen to get started.